When young brides think of yellow gold, many think of their parents or people in earlier generations who most likely will have a yellow gold engagement ring. But more recently, we've seen a lot of women asking to see yellow gold rings for themselves. So is yellow gold actually still popular for engagement rings today? In the 1960-80's, gold was the standard for bridal jewelry. It was very popular, and you wouldn't find many rings from that time that were made of white metals. Yellow gold quickly became synonymous with more traditional and classic style. Starting around the mid 1990's, yellow gold fell out of fashion for wedding and engagement rings. Other white metals, like platinum or white gold, became a popular choice for their cool, sleek look. These white metals became the modern standard for all engagement and wedding ring metals, and they still dominate the market today. Not until very recently have we started to see a shift back towards more traditional yellow gold rings. Until now, many people considered yellow gold engagement rings to be dated. They had a reputation for looking old and tired. But now, many are welcoming back this yellow metal as vintage-inspired rings and jewelry have come back in style. 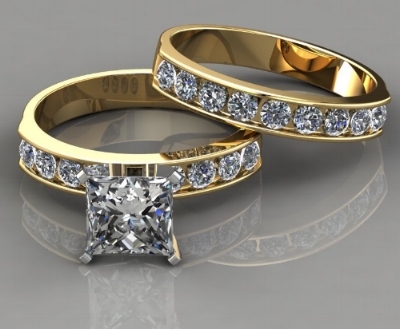 Yellow gold has become more appealing to young brides. 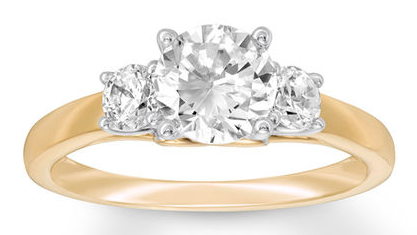 Yellow gold is no longer considered a metal of the past when it comes to bridal jewelry. Now, women love the idea of yellow gold engagement rings. They are much more unique than rings made with more modern white metals. Yellow gold adds a softness to the ring that gives a nod to the 19th century, a much more romantic era. You can now think of yellow gold as "old school glam." Not only is yellow gold appealing because of its recent popularity, it's also much easier to maintain than white gold. Unlike yellow gold, white gold requires periodic rhodium plating in order to keep the color of the ring looking white over the years. Also, yellow gold has similar hypoallergenic qualities as platinum and is less likely to cause a allergic reaction than white gold. While we can't predict what exactly will happen with yellow gold, we have a strong feeling that it's around to stay for a while. 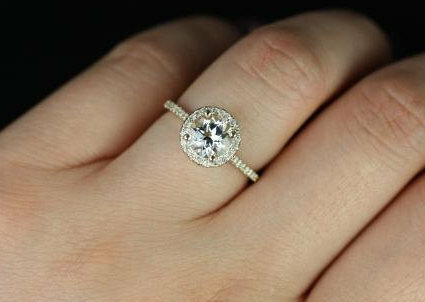 We predict that we'll be seeing more celebrities on the Red Carpet sporting yellow engagement rings. In our opinion, the style isn't going anywhere any time soon. Yellow gold is a timeless and classic metal which has a natural richness. It looks great on darker complexions, olive skin tones, and dark hair or eyes. White metals, on the other hand, look great on people with fair skin or rosy undertones. This difference alone is enough to consistently have a market for both types of metals in the future.